The Go Wireless Temp has been replaced by the Go Direct Temperature Sensor. 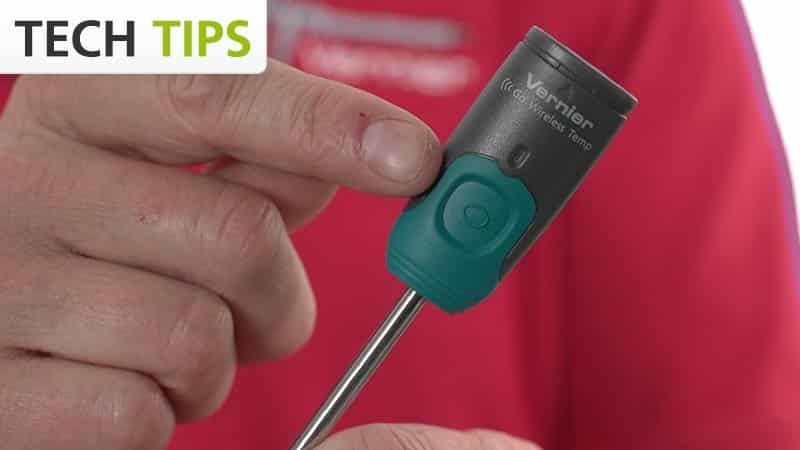 The Vernier Go Wireless Temp is a rugged, general-purpose, wireless temperature sensor you can use to remotely monitor temperature with a mobile device. The rugged, all-purpose Go Wireless Temp gives you the advantage of go-anywhere, work-anywhere wireless connectivity. Because it is also waterproof, Go Wireless Temp is more durable than sensors that are simply water resistant. Real-time Measurements. One Time or Over Time. Go Wireless Temp charges in just two hours and will collect data continuously for three days. You can easily monitor the battery status using our free Graphical Analysis GW app. Should the battery run low, simply connect the sensor to the charging cable and keep on collecting—no interruptions or inconvenience for students or teachers. Like all the sensors in our Go Wireless lineup, using the Go Wireless Temp with iPad is quick and easy. Simply download our free Graphical Analysis GW app. Go Wireless Temp can also be used directly with the LabQuest 2 for data collection and analysis on the LabQuest 2 itself. For advanced analysis options, connect your LabQuest 2 to a computer and export data into Logger Pro 3. The Go Wireless® Temp may require a compatible interface and software. Choose a platform below to see compatible interface and software options. The Go Wireless® Temp is fully supported with LabQuest 2 (version 2.8.5), a standalone data logger with built-in graphing and analysis software. Not supported on Windows computers running Windows 10 Creator's Edition (build 1703 or later).